The Busy Mum’s Cookbook is the latest publication from food writer Annabel Karmel and was published a couple of months ago. My family have grown up with Annabel’s recipes right from when I started weaning my daughter back in 1998 using purees from the Baby and Toddler Meal Planner. I’ve bought several of her books over the years from her Family Meal Planner, to her Kids In The Kitchen inspired books, to her party recipe one. I’ve kept all the books though I don’t think my kids would appreciate butternut squash purees now! Having said that, I regularly go back to recipes from the Family Meal Planner, which has been my lifesaver in the kitchen for the past 16 years. So, when Annabel brings out a new book which isn’t directed at babies and toddlers, I’m always keen to buy it. I was very impressed with the Busy Mum’s Cookbook as it fits into my lifestyle. I work most days as a supply teacher, a job I love but I’m always shattered when I get in from school. All the recipes I have tried out of the book so far have fitted into the slot of being suitable for busy parents and not just Mums! I have easily fallen into that trap. I think I’ve cooked chilli con carne or chicken curry every week for the past year but I do it because I know my son will eat it. Annabel Karmel’s own children have always been a massive part of her cookery career, she tests recipes out on them and there used to be photos of them in her earlier books. Now they are grown up but they still influence her recipes, just like I do when I try to recreate my own dishes at home. The Busy Mum’s Cookbook is split up into seven sections each featuring a stack of recipes to suit all lifestyles. Roasted Tomato and Pesto Pasta. Chapter One is called “20 Minute Recipes” and features plenty of recipes which can be cooked in a very short time. 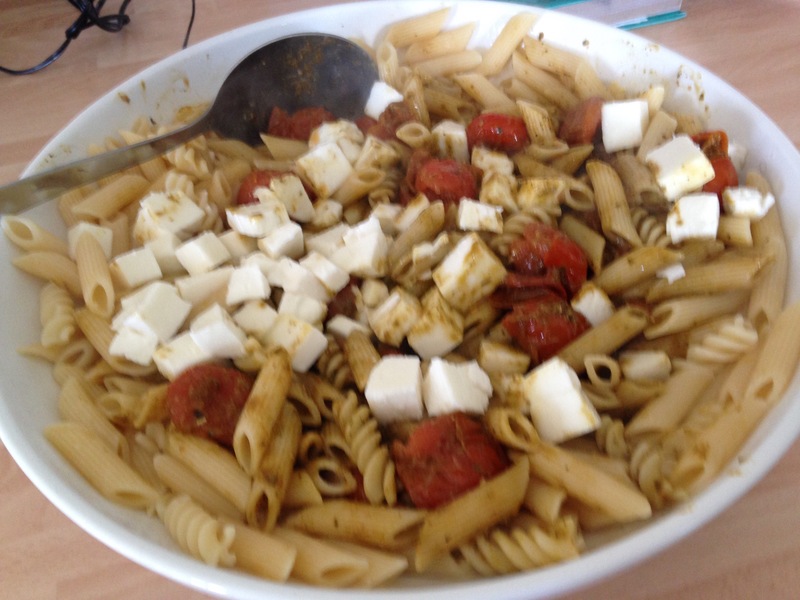 Last Monday evening I tried out the Penne with Roasted Tomatoes and Pesto on my family. It says the cooking time is 10 mins and the preparation time, 8 minutes. I had to roast the cherry tomatoes in the oven with garlic, olive oil and balsamic vinegar which took all of 10 minutes. While the tomatoes were roasting the pasta was cooking on the hob. When it had cooked I added pesto sauce to the pasta and mixed it with the tomatoes and mozzarella pieces. Ideal for a a quick weeknight supper. To me it sounded like McVities Jamaican Ginger Cake which I used to eat as a child for tea at my Nana Margaret’s house. I’ve not had it for years. So I was tempted to try baking the cake to see if it was the same. 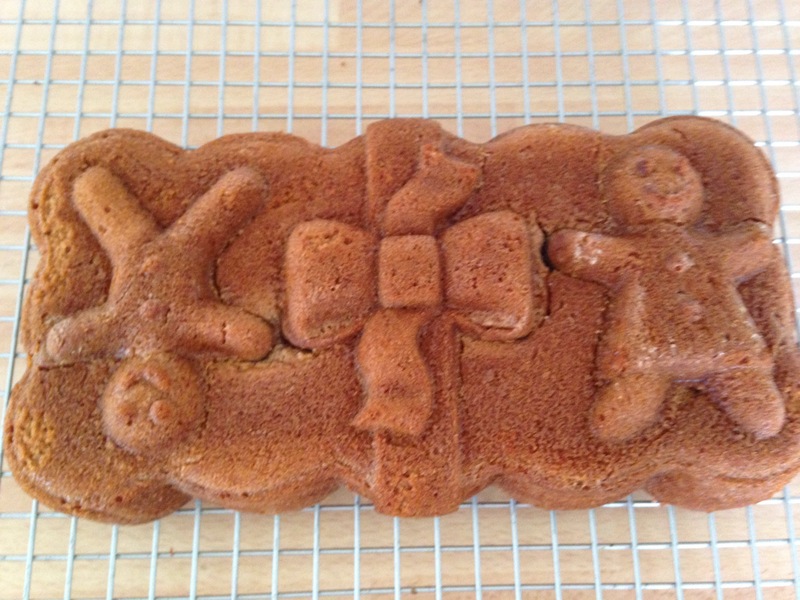 I used my Nordicware Gingerbread Man Loaf Bundt pan which has only been used once before, great to give it another outing. I greased the pan well with Wilton Cake Release. Flour, caster sugar, cinnamon and ginger were combined in one bowl. In another in went eggs, sunflower oil and golden syrup. They were then mixed together and the batter poured into the tin. It tasted lovely even though I could have done with more mixture to fill the tin! It looked very small! 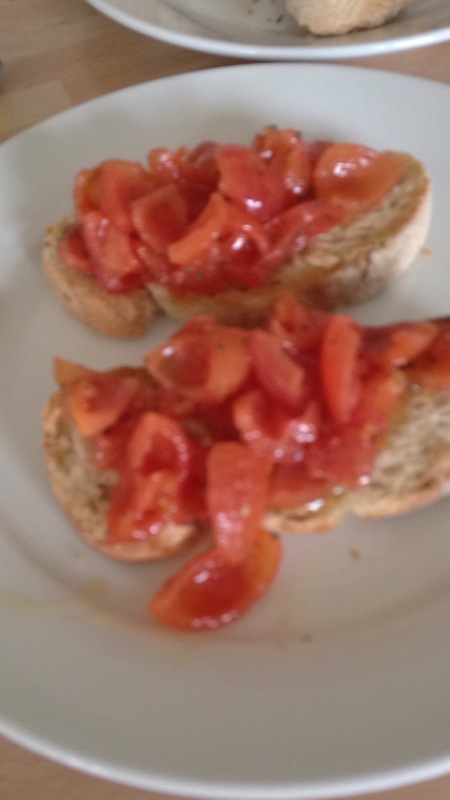 Three Tomato Bruschetta, although only one type was used in my version. Last Friday night was perfect to sit out and enjoy the gorgeous sunny weather. I had loads of tomatoes to use up and had the idea of making the Three Tomato Bruschettas for my family. Though we only had one type of tomato, this recipe was a lot more fiddly than I thought. I had to peel and de-seed a whole punnet of cherry tomatoes which took a lot of time. The Bruschetta recipe is in the Lunchboxes and Snacks chapter. Lunchboxes is something I never get right. When my kids were at primary school they had Lunchboxes and I used Annabel’s own Lunchboxes book for ideas when my daughter first started in Reception. Her pasta salads and fruit salads with dips would come back untouched and she used to say “Why can’t I have fruit winders in my lunchbox?” Or “……has Cheesestrings in hers, why can’t I?” I tend to be a bit disorganised with my own lunches, I end up with half a carton of soup or a noodle pot. If I’m feeling really lazy then I buy a sandwich from a local garage with an M&S food shop attached to it. Same goes for my husband, when he’s working in his office, he’s across the road from a fantastic bakery so he nips there for a sandwich or a pasty. The kids follow what their friends are doing in town. So unless I sort myself out, I can’t see myself using the lunch box recipes much! Anyone who knows me well knows that I love baking biscuits, hence my blog name SmartCookieSam. 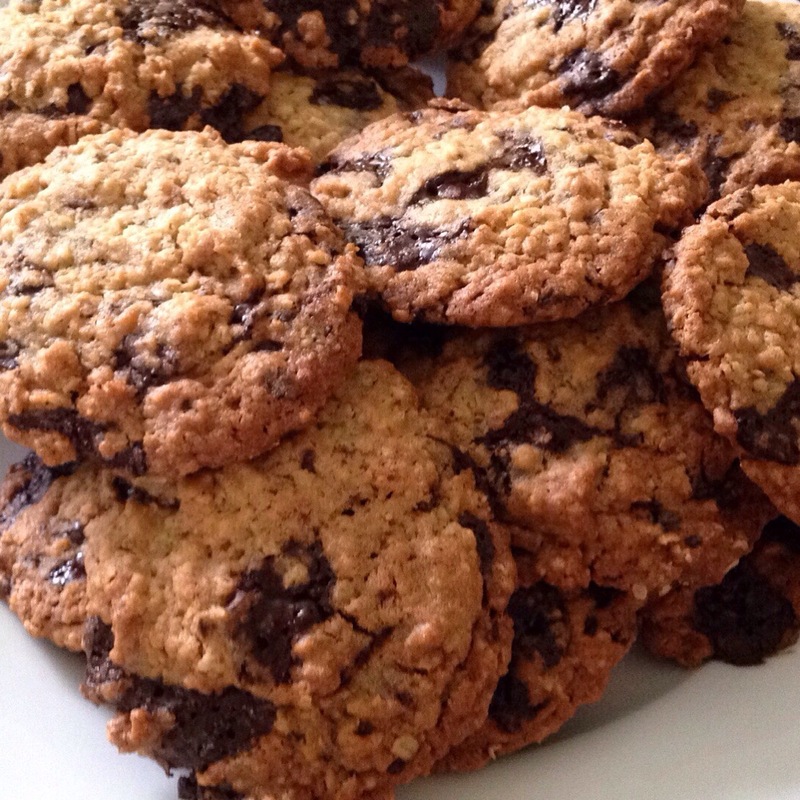 Last Friday I had some spare time and decided to bake some of Annabel’s Chocolate and Oat Cookies. My son is going through his GCSEs at the moment and my daughter has been busy in her college course. What better than a sweet treat to start half term off? The cookies were very simple to make using butter, brown sugar, flour, an egg, some vanilla extract, baking powder, a small amount of ground ginger, porridge oats and dark chocolate cut into chunks. No sooner than they had been put on the cooling rack, then half of them disappeared! That’s a good sign. If they’re still there in the biscuit tin a few days later that’s when I start getting worried. 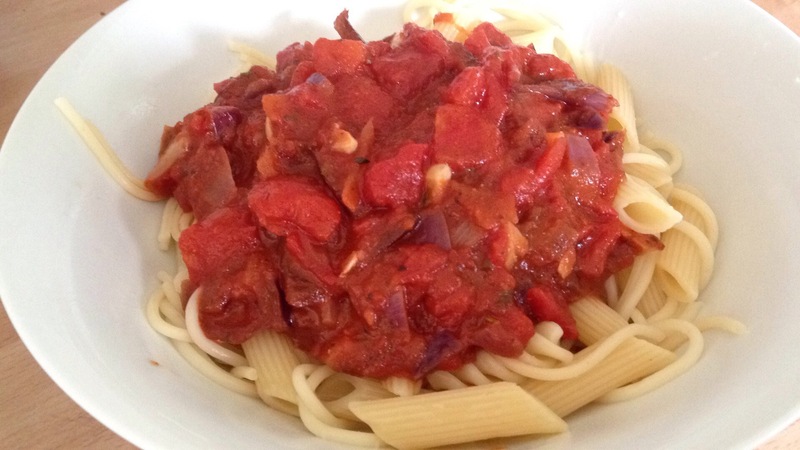 My son and husband aren’t massive pasta fans but they liked the Pasta Arrabiata recipe. It was a perfect standby storecupboard supper to knock up after a busy day at work. It went very well washed down with a couple of glasses of wine! I forgot to tell hubby that Arrabiata sauce has chillies in it! There was another chapter in the book dedicated to Entertaining. Well I can’t remember the last time I had friends round for dinner. It was probably about 10 years ago. Ever since I went back to work doing dinner parties is the last thing on my mind. Though I have had several parties and get togethers. This usually ends up being buffet food or a BBQ or maybe cakes and lots of drink though! I can’t see me cooking any recipes from the Entertaining chapter soon, though! So, to sum up I was extremely impressed with Annabel’s book. It is going to be well used in the next few years I bet as it was the case with her baby and toddler feeding books. I can wholeheartedly recommend it! Previous Post Banana Cake from the Nordic Bakery Cookbook. Next Post Graeme Clark’s Gig at Siempre Bicycle Cafe, Glasgow- A Review.